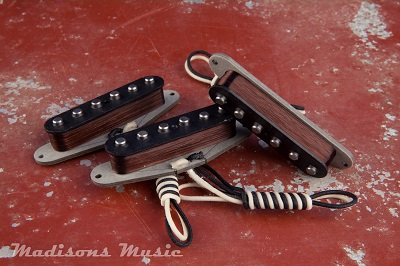 Our Pre CBS grey bobbin Strat pickups are based off a '64 set. Slightly overwound in comparison to our 50's set. Hand wound with 42 plain enamel wire. Alnico 5 magnets with staggered poles and beveled tops. Our 60's strat pickups offer the bright bubbly tone you expect out of an early strat. Nice noticable mid range and clear overtones.